The outstanding feature of belt brushes is the flexibility of the belt backing, which allows the surface of the brush to adapt to almost any contour. As an example, they are used in cases where there is insufficient space for a brush with a rigid body and correspondingly flexible bristles. Belt brushes can be filled with synthetic or natural bristles ranging in nature from soft to hard. At the same time, however, they are also used as high resistance brushes. Belt brushes can be used horizontally, vertically or at an angle. They can also be ideally used as a transverse brushing system, e.g. for brushing to one side at right angles to the running direction of conveyor belts or similar. We can produce flat-belt brushes in any length requested, open ended or endless. They are mainly equipped with natural hairs or bristles, plant fibres or synthetic bristles. Depending on the fill material a brush surface from very soft to very hard can be obtained. For this brush type we use standardised vee-belt profiles, made of polyester elastomers and immune to moisture, oil and grease as well as resistant to numerous chemicals. Therefore an application is possible in a temperature range from -15°C to +80°C. Mainly natural hairs and bristles, plant fibres and synthetic bristles (PA, PP, etc.) are used, so all kinds of brush surface - from very soft to very hard - can be obtained according to the material quality chosen. 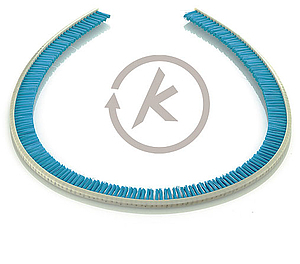 Toothed belt brushes from KULLEN are a version of common belt brushes and therefore are appropriate for the same application purposes. However, they offer one advantage in the feeding technique which the others do not: they can be set to a measurable cycle time. 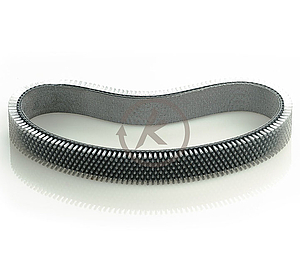 We only use standard toothed belts made of polyurethane with especially welded studs for fixing the fill material. 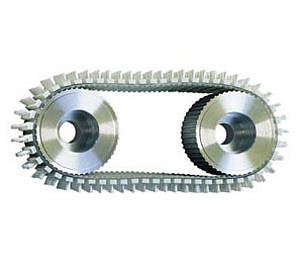 The toothed belts are resistant against humidity, oils, greases and most chemicals. They can be used at temperatures between -15°C up to 80°C.